Born at sea in the Atlantic Ocean. Died in Wilmington, North Carolina. CSNCSNCSNCSNCSNCSNCSNCSNCSNCSNCSNCSNCSNCSN CSNCSNCSNCSNCSNCSNCSNCSNCSNCSNCSNCSNCSNCSN Photo courtesy Bill Chisolm of FL * Oakdale Cemetery, Wilmington, North Carolina Photos courtesy Robert J. Cooke of NC JOHN N. MAFFITT by James Sprunt of NC (family friend) 2 August 1896 (SHSP) Among that devoted band of United States navy officers whose home and kindred were in the South at the outbreak of the war, and who resigned their commissions rather than aid in subjugating their native State, there were none braver nor truer than our own Captain John N. Maffitt, who, yielding to necessity, severed the strong ties of a service under the old flag in which he had long distinguished himself, and relinquished not only a conspicuous position directly in the line of speedy promotion to the rank of admiral, but sacrificed at the same time his entire fortune, which was invested in the North, and which was confiscated shortly afterward by the Federal Government. The biography of this modest hero has never been written. I give the following brief sketch prepared by the accomplished Mrs. J. N. Maffitt, at the time of her distinguished husband's decease, who is now writing a more extended memoir of his career. 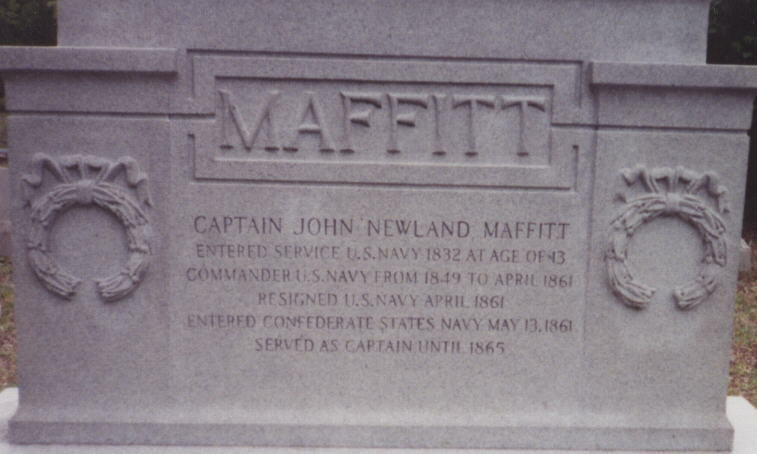 John Newland Maffitt was born at sea on the 22d of February, 1819 His parents were Rev. John Newland Maffitt and Ann Carnicke, his wife. Rev. Mr. Maffitt, having determined to emigrate to America, left Ireland with his wife and family late in January or early in February, and landed in New York on the 21st of April, 1819, his son having been born on the passage. Their first home was in Connecticut. When John was about five years old, his uncle, Dr. William Maffitt, who had accompanied them to America, visited his brother, Rev. 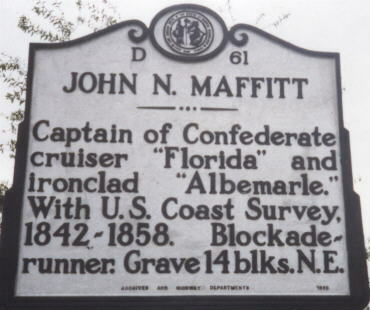 Mr. Maffitt, and finding him in straitened circumstances, begged to adopt their son, and on the consent of his parents, Dr. Maffitt brought his nephew to Fayetteville, N. C. Some years were passed in this happy home of his boyhood, when his uncle determined to send him to school at White Plains, N. Y. As a little stripling, he started by the old-time stage coach, with his ticket tacked to his jacket, and on his arrival much curiosity was shown to see the little boy who had come alone from his distant southern home. He remained at this school, under Professor Swinburn, until he was thirteen years old, when his father's friends obtained for him a commission as midshipman in the United States Navy. His first orders were to the St. Louis, then at Pensacola Navy-Yard. His second sea orders were to the Constitution, the flagship of the squadron, commanded by Commodore Elliott, then fitting out for the Mediterranean. This cruise lasted three years and six months, and it was during that time that most of the incidents related in the Nautilers took place. Having been appointed aide to Commodore Elliott, the young midshipman had many advantages not otherwise obtainable. He was next ordered to the frigate Macedonian as past midshipman, and it was while in port at Pensacola, Fla., that he had his first experience of "yellow jack," and came near losing his life. His first independent command was the Gallatin. 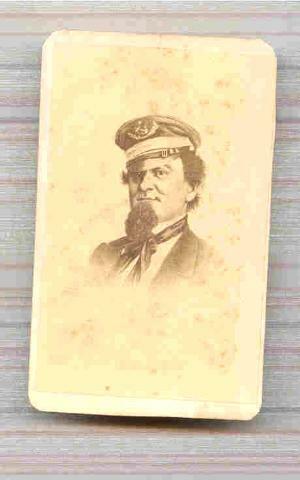 He commanded also the brig Dolphin and several others. He was engaged, under Professor Bache, for some years on the coast survey, and was of great service to the professor, which the latter was not slow to acknowledge. Much of their work was in the harbors of Nantucket, Charleston, Wilmington, and Savannah. A channel in the harbor of Charleston still bears his name. In one of the numerous published sketches this tribute is paid to him: A SPLENDID OFFICER "He was always considered one of the best officers and most high-toned gentlemen of the old service. For some years he was connected with the coast survey, and Professor Bache, the head of the department, declared that if Maffitt was taken from him he could not supply his place in all the navy." He added: "He is not only a thorough seaman and game to the backbone, but a man of superior intellect, a humorist of rare excellence, and one of the most delightful companions. There is no position in his profession which Maffitt is not capable of filling with honor and distinction." This was his acknowledged position when the war began. His last command while in the service of the United States, was the Crusader. He was very successful in capturing slavers. In January, 1860, while in command of the Crusader, and also acting as paymaster of the vessel, he was ordered by the Secretary of the Navy to proceed to Mobile, and there cash a check on the collector of the port for prize money due the officers and crew. The city being agitated at the time by the Ordinance of Secession, just passed by the State of Alabama, he was forced to put his vessel in a defensive position, and soon retired to the port of Habana. Here, failing to negotiate with the bank of Habana for the funds requisite for the necessities of the vessel, he advanced from his private funds the money needed to work the steamer to New York, where he was ordered. He turned the steamer over to the proper authorities and went to Washington to settle his accounts. His cash accounts received no attention, though for several months he was a constant applicant for settlement. A trying position was his, as his wife was dead, and his children had no kinsfolk, save in North Carolina; if he remained in the navy his property, which was all in the North, would be secured to him. All that appealed to his interests lay there. Love of his profession was entwined with every fibre of his being. On the other hand, he would have been compelled to fight against his people---perhaps fire upon the very home that had sheltered him, and was then sheltering his defenceless children. One night a friend informed him that his name was down for arrest the next day. His affections drew him South. His resignation having been accepted, he felt free to leave and cast his fortunes with his people. During the earlier part of the war he commanded the celebrated Confederate corvette Florida, and the ram Albemarle, rendering most valuable service to the Confederacy. Afterwards he was in command of the blockade-runners Lillian, Owl, and other vessels engaged in bringing supplies and munitions of war for the South. At the close of the war, his property confiscated and he an exile, he applied for a command in the English merchant service, and was given the command of a fine steamer, running between Liverpool and Rio Janeiro. She was subsequently sold to the Brazilian Government and used as an army transport. While conveying several hundred soldiers to the scene of action, small-pox broke out among them, and as the well refused to nurse the sick, or bury the dead, those duties devolved upon Captain Maffitt, and a fearful time he had--" sickening to the last degree," he described it--and the soldiers were mutinous and without discipline. He retained command of this steamer for eighteen months, when, at the urgent entreaty of his family, he resigned the command and came home. He soon after purchased a small farm near Wilmington, where he resided for nearly eighteen years. In July, 1885, he moved to Wilmington. For a year or two his health had been failing, but he determined to make a brave effort to retrieve his fortunes and provide for his young family. The disappointment of that hope was too great a shock for his feeble frame; the thought that he could no longer provide for his loved ones broke his heart. After an illness of more than three months, he died on the 15th of May, 1886, in the sixty-eighth year of his age. MUCH MORE TO COME, please check back.